Global Species Databases (GSD) have been sending their taxonomic checklists to the Catalogue of Life (CoL) since 2000. On receipt of these checklists the CoL team integrates them into one unified checklist - The Catalogue of Life. This is both a routine procedure (as updates are periodically provided from the same GSDs) and a manual one because any new taxonomic data is subject to integrity checks by editors. This maintains the authoritative status of the CoL above all other global species checklists. However, maintaining an expert database has meant a cautious approach to adding species, and so to-date this checklist of the world's organisms is only 70% complete. It is disappointing to our users when they cannot find their taxon when in a gap area. 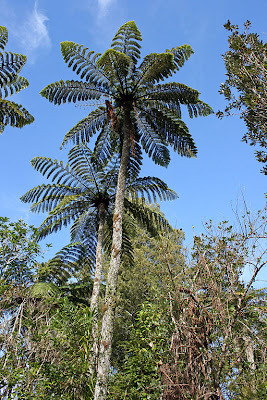 Often it may be a well known organism (like the Black tree fern Cyathea medullaris shown above) making people wonder why it couldn't just add it. Well the answer is the Catalogue of Life does not add or annotate species itself, it only lists names adopted by expert taxonomists in their GSDs. If a name is not in one of the contributing GSDs or one of our proto-GSDs it will not be in the Catalogue of Life. So where are the other ~30% of known species names? Well one answer is that they may not be in an electronic global checklist format anywhere as yet. They may be in scientific publications or monographs, regional floras or faunas but not in a database. Alternatively, ones that do exist, may not have been submitted to the Catalogue of Life because the taxonomist in question is reluctant to hand over their hard earned data for public use. A checklist is the culmination of a great deal of taxonomic work and time. For some taxonomists who collected original data, it is their whole life's work. So to give it away for free is a big decision. When data is aggregated (as it is within the Catalogue of Life) there are all sorts of issues with attribution and individual property rights which makes for complexity in the supply and use of that data. This is why the Catalogue of Life explicitly links all data back to the GSD that supplied it, to give that GSD the maximum amount of credit and publicity for their work. And where that data is passed on to global biodiversity partners (Encylopedia of Life, GBIF, ENA, IUCN), the Catalogue of Life asks for continued attribution to the GSD in the partners' data portal. Luckily, this is enough for many GSDs and they are able to make that data readily available to the wider world, but perhaps if they were not so globally minded the Catalogue of Life would not exist. This is why the Catalogue of Life wants to promote taxonomists and the work they do, to ensure that it is not taken for granted by the end user. To continue to fill gaps the Catalogue of Life team carries out the following activities: 1) it searches for taxonomists who have checklists and are willing to contribute; 2) it creates proto-GSDs where a possibility exists to do so; and 3) through the i4Life project, it funds taxonomists to create new GSDs to fill priority gap areas that it knows are of importance to global biodiversity partners (and hence end users). This last way is known as the 'Pilot Projects', a currently ongoing workflow within the i4Life project that aims to place as many new names and taxa from global biodiversity partners into scrutinised taxonomic checklists as possible and then supply them to the Catalogue of Life. The Catalogue of Life then, in turn, supplies them back to the global biodiversity partners, improving the quality of their taxonomic data in the process. The goal is both to add many thousands of new names to the Catalogue of Life (moving closer to the estimated 1.9m known species that are believed to exist somewhere in the world) and to create consistency in the quality of taxonomy partner databases. Later on in the Catalogue of Life blog, we will look at the Pilot projects in greater detail. In the meantime if you type a species name into the search box and find that it is not there, please be reassured that the Catalogue of Life is fully aware of it, and is doing all it can to find a supplier for this taxon group. And if you are a student of taxonomy doing the typing, you may want to think about one day creating an electronic global species checklist and contributing to the Catalogue of Life community!